Earlier in the year, I received an invitation to meet with friends in Oregon, USA to see the eclipse and attend a music festival. Given that tiny houses are very popular in that area, and that they had a tiny house model that was working better than any we have here in Australia, of course, I jumped at the opportunity to go and do some research, see the eclipse and have a holiday with some friends. I mean, who wouldn’t right? Three birds with one stone. Brilliant! Once we had made the decision, it was time to get to work. My friend Cam and I started planning. I began looking up what tiny house resources that would be in the areas we would be visiting and started writing to a bunch of people who I had never met. Thankfully, and surprisingly, this strangers’ messages and emails were well received, and we found a great group of people that were more than happy to help in the research goals. I even had a few strangers reach out to me and offer their assistance and extend invitations. It’s amazing how things, with some effort, just came together beautifully. So, after months of planning, on the 7th of August, Cam and I excitedly jumped on a plane bound for Portland. The journey wasn’t without it its hiccups. A couple of delays getting into LA, luggage transfers, issues finding suitable SIM for data to help us get around and blog with ease (what the heck did I do before mobile phones and the Internet? I vaguely remember getting along just fine without it. May be time to unplug for a bit). Despite the challenges, we made it, exhausted but happy to be there. First stop, a tiny house Airbnb in Portland to rest, recharge and recover from our trip. Before I go into too much detail about the tiny house itself, I’d like to explain why tiny houses are working better in Portland than here in Australia. Compared to Australia, America has more flexibility when it comes to tiny house design. This flexibility is due to things like towing rules, building codes and the size of the trucks allowed on the road (that had Cam drooling like Pavlov’s dog every time a Chevy truck went past. ? ), but I’ve spoken about those things before. I won’t bore you with them again now. In 1979 Portland adopted an urban growth boundary (UGB) to control the use of land, protect forest and wildlife and limit the impact of urban sprawl into the surrounding areas. Since adopting this policy, the boundary has been amended 35 times to cater to the growing city, but the population is booming. Despite these changes, the UGB has meant Portland locals have needed to use a limited space to house the population and has led to more creative solutions to cater for the growing requirements of the city’s residents. From the conversations I’ve had, there are many mixed views on the UGB. Now, I must be clear that I don’t have enough information to speak of all the pros and cons of the UGB (but I’m happy for someone to sponsor me to go back to do further research. Just saying. ?). I can only speak from a visitor’s perspective. I understand that this model creates higher density and drives up living expenses for those living in that area. Although the cost of living is far lower than here in Australia, the minimum wage is also far lower, so there are many factors to be considered before I could come close to claiming to have a well-versed view. Personally, I like the idea of capping urban growth to protect the environment and farmland, slow sprawl and encourage urban density, by surrounding an area with a preservation ring of large-lot agricultural zoning. When speaking with tiny home owners, I found out that Portland is not without its own set of tiny home challenges, but the UGB combined with the sheer determination and persistence of tiny home owners has helped push through some tiny homes as legal builds in the city of Portland. I also found that not all tiny homes are constructed legally, and many people are banking on flying under the radar, so it’s not all smooth sailing. Still, tiny homes are more accepted and get the relevant approvals far more easily than what we do here in Australia. Another plus that kept coming up was that the UGB does seem to challenge more people to live with what they need, rather than what they think they need, and from my perspective, that’s a significant side effect. Don’t get me wrong, consumerism is still at a CRAZY level, but those living in a smaller environment tend not to purchase as much stuff to fill the space as someone occupying a larger property (minimalists living in larger houses being the obvious exception). It just makes sense to me that more people living in smaller environments cannot consume as much unnecessary stuff and are forced to think more about their purchasing habits. Anyways, I’ve gone off on a tangent. Now you have a little bit of a back story, back to the tiny home. This place was cute! A converted garage in the backyard of a property, not too far from a lovely little shopping district in Portland. I would consider this Airbnb to be more of a short stay granny flat/guest house than a home that could be comfortably lived in the long term. The tiny consisted of two main spaces, a general living area (lounge/bedroom and kitchenette), and a bathroom area. Power and plumbing supply for this tiny house is hooked up to the main house systems, and it had all your basic creature comforts that you would expect to find in a holiday unit. The living area had a bed that could be folded up to make a lounge if you wished and a fold out table big enough for two people to share a meal. As much as this was functional, I didn’t feel it was a great use of space. I wouldn’t want to fold a bed up daily, and having both the table and the bed down at once did make the living area feel cramped. Opening the doors to the patio did help the area feel less congested, but personally, hating the cold as much as I do, I don’t like the idea of the sense of space being compromised by the weather. Also, general storage would be an issue if you were to be living in this tiny full time as the only storage was bathroom storage. The bathroom was nicely done, and it had a great feel to it. A full-sized shower, a standard flushing toilet, and well-designed bathroom storage. When the door was closed, you could almost forget that you were in a tiny house. The overall design was contemporary, clean, light-filled, and charming. 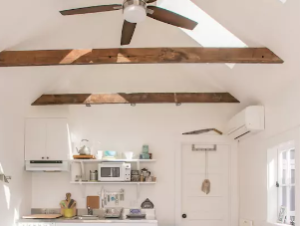 I especially liked the skylights, the exposed beams, the design of the kitchenette and the French doors that opened onto a covered patio area. However, any stay for an extended period would require a much more thought-out design and the addition of some smart storage solutions. 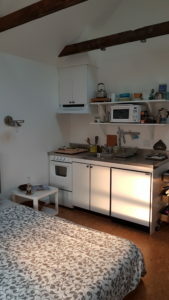 Still, this tiny was well-crafted and well suited to its purpose as a short stay Airbnb. Would I stay again? Oh, hell no! Although the tiny home was charming, our host certainly was not. Well, she was fine at the start, but overall our experience with her most definitely soured the start of our trip. That’s a whole other story, and I’d rather not waste my energy or focus on that. I’ll just say that if you are thinking of going down the Airbnb road, then having a high level of professionalism, crystal-clear communication, and warm hospitality is a great place to start. People are paying for an experience, and I don’t think the host should carry themselves in any way that takes away from that experience. Thankfully, every other host we encountered while in the Oregon was delightful, and the bad experience we had had with our first host was quickly put behind us as we moved on to the next part of our adventure. With the tiny house movement gaining steam across Australia, places such as Melbourne are also starting to realize that tiny houses could be a viable part of the solution to density issues here as well. Personally, I’m excited to see how the movement is unfolding, and, from what I’ve seen in the last 12 months, there looks like there is going to be a lot of tiny house action over the next few years. What an awesome adventure. What the best tiny house / multi-use feature or built in furniture you saw on your tour? Interestingly, I did not see too many multi-use bits of furniture. I was expecting to see more. Sure, we saw Murphy beds, fold up couches, retractable storage, and extendable tables, but not anything that stood out as a brilliant innovative multi-functional furniture design. I found that the focus was on multi-functional and adaptable spaces. The best example was a lounge room that converts to a dining room, to an office, to a cinema (cinema screen acting as a wall divider/privacy screen) and to a yoga space. From the tiny homes we saw, I came to the conclusion that flexibility of the space itself is far more important than multi-functional pieces. Before the trip, I was slightly obsessed with multi-functional furniture. Now I’m more inclined to think that a lot of multi-functional furniture (unless it has more than two or three different uses) can be really restrictive, and that fold away options that give the homeowner back flexibility of the space itself are often a better choice for occupants that will be staying for an extended period of time. Thank you for the positive feedback. It’s always lovely to received kind words of encouragement. Much appreciated. What error message are you receiving? I certainly want any and all errors fixed asap. I’ve just tested it and it seems to be working fine my end. Hi to all, how is all, I think every one is getting more from this website, and your views are nice designed for new visitors. I like the valuable info you supply on your articles. I will bookmark your weblog and check once more right here regularly. I’m rather certain I will be told a lot of new stuff right right here! Good luck for the following!